Kiip, a mobile rewards platform, was recently highlighted by Nielsen as having a unique approach to branding that beat the measurement company's brand awareness norms by a factor of nine. 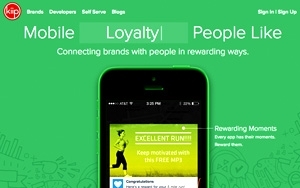 Kiip CEO Brian Wong says that he sees two approaches to branding taking shape on mobile. The first is mobile video, which allows brands to spend time building an emotional relationship with users using imagery. The second, his method, is to spend as little time as possible with a user, while rewarding them for an achievement in-app. Wong says this impromptu approach is often unexpected, and touches on positive branding, loyalty and CRM data (when the customer enters their email address to receive a voucher for a reward) all at the same time. A single dollar spent on an ad through Kiip can accomplish three different marketing objectives. According to Nielsen, brand lift is the percentage increase in the primary objective of a brand advertising campaign. Brand marketers use surveys to measure the extent to which their advertising has shifted consumer perception against awareness, attitudes, favorability, intent or preference. “Usually these surveys are tiny little links at the bottom of an ad. We worked with them to create a survey format that was mobile optimized,” says Wong. And it paid off. “Response rates were astronomical,” he says, reaching 28%. Their response rate also has implications for the methodology with which consumers are surveyed, and Wong says he hopes to take advantage of this rise to gain market insights. Kiip (pronounced “keep”) deals in mobile moments. Wong worries that the word “moments” will loose its meaning as its popularity as a marketing buzzword continues to rise. “A moment is an event with a context,” he says, context being weather or physical location or time of day. The company also had a pretty good 2015, growing its engagements by 230% last year and delivering 583 million rewards. Wong attributes much of their growth to the confluence of several trends, including the rise of ad blocking and industry awareness about the difference between mobile Web inventory and in-app inventory. 1 comment about "Kiip Sees 230% Growth in 2015, Promotes Positive Branding". Jason Newport from Carat, January 16, 2016 at 10:19 p.m.
Brian, hey! Congrats! I'm shouting out your whole crew led by Ali as well what you pointed out in the interview re: growth logic... really, really proud of you guys... keep going; keep making it all better!